Reviews | Regal Tarragon Leaves - 1 oz. Add a unique, anise-like flavor to chicken, fish, and egg dishes with Regal tarragon leaves! Dark green in color and delicate in texture, these leaf flakes have a licorice-like taste that imparts a slightly bittersweet flavor to your recipes. we use a lot of tarragon leaves in our chicken nd beef dishes and tried the regal brand mainly due to being a lot cheper.it tasted great! Love the taste of tarragon in my Greek and Mediterranean dishes. A nice bold flavor and these leaves are fresh. So much better than the local store. A nice quality spice that is priced perfectly and great for home use. I love the tarragon and its especially delicious on chicken. The leaves are bold and fresh. Tarragon has a very subtle flavor. Great for foods that associate with spring: salmon, chicken, veal, rabbit, eggs and baby vegetables. A little bit of this herb will go a long way! Good quality spices at a great price. I keep the large bottle in my freezer and just refill my smaller container as I need it. Tarragon leaves have an authentic and aromatic flavor. It is used in many Mediterranean dishes which I love! Also used as a nice garnish would recommend a try. I have used the one ounce bottle of Regal Tarragon Leaves in the past and it continues to meet my expectations. The taste is remarkable for it not being fresh leaves and they are the perfect addition to any soup. I like how easy they are to order and will continue to do so. The fast shipping and quantity discounts are a huge plus. I was a little surprised at how fast the one ounce disappeared. I've recently made a few new Italian recipes and this tarragon is really excellent. It made a difference in my preparations and I had a chance to compare it to a little tarragon I had left over of a popular store brand. The Regal was much better. The tarragon leaves are great. These are some of the best quality tarragon leaves I have every bought. They go great in my tarragon pasta. Decent tarragon. Since it's so easy to grow, we prefer fresh. This is good to have on hand for hollaindaise and others on occassion, however. The Regal tarragon leaves are very top notch quality. They are great for making our tarragon chicken and add a great flavor. The product is definitely exceed your expectations. 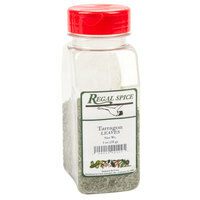 unlike a lot of other brands of dried herbs, this tarragon by regal spice is in nice large pieces and it tastes great. even the leaves are still very green and fragrant. it's a great product. You can't beat the price for this tarragon. You could easily pay 4 to 5 times this price in the grocery store or almost anywhere online. It's decent quality at a great price. I will definitely buy this again. The dried spices from Regal are amazing. They always provide exceptional color and flavor…and the textures are so much more dynamic than grocery store brands. This is a magical herb!!! Don't make anything with pork or mac n cheese without again! People keep coming back asking what the secret is to great food. It's all in the right herbs and spices. Excellent tarragon leaves. Great price for a large size bottle. The leaves were fresh and fragrant. A great value for tarragon leaves. I will buy again. Tarragon leaves are a spice staple predominantly in France. We like to cook with it and add to white wine vinegar, creating a sweet perfume like flavor that is a bit sweet. A perfect pairing for foods like fish and omelets. It doesn't take a lot and 1oz. will last a long time. Tarragon leaves are great, i feel they are very under used in a lot of american cooking. Product arrived fresh and has some amazing aroma and flavor. I absolutely love this product! I always use Tarragon seasoning and this one is just so fresh! It comes in a plastic container and is 1oz full. Anyone who loves cooking Indian food need to have this spice in their pantry! Great small and nice texture or large leaves. I definitely recommend this one! Tarragon leaf is a nice to use in a blend for lasagna sauce. Combine it with others and it makes a fantastic addition to your pasta dish. I once had a sample of mint tea with tarragon in a flavored tea variety pack. It was sweet but not too sweet. I can now make my own. I live in a rural area and finding more exotic spices for my kitchen is a difficult task. Quite a useful find for my home cooking plus a size large enough to make my own tarragon vinegar. Some of this tarragon is a little bit darker than I am used to. The flavor is there, but the color is off just a little bit. Love the sweetness of this spice, use in cooking almost Dailey. Made wonderful tarragon , saugase, cheese muffins for an event!! They were great! Good price for the size of container. I bought this because tarragon leaves sold at grocery store is a lot of money for just a tiny amount. But not with this one bottle. And the cap design helps this herb to stay fresh. i have it in my soups, salads and some stews - almost in any recipe. It is up to you to add in your recipes. Happy I bought it. The fresh flavor of this tarragon is amazing the herb was Stillgreen and had a very fresh smell I recommend you buy multiples because they are small . Full flavored herbs. Great price and product. Regal products are hard to beat for value and flavor. Mix and match is a great way to stock up. These Regal Spices Tarragon Leaves are a great substitute for fresh bought leaves that don't last very long. This spice works the best in a chicken dish with gravy and mushrooms. The flavor and aroma it provides is very delicious and worth a try. I would recommend it to anyone....you won't be disappointed. Great price for tarragon. It's very fresh. I think tarragon is one of those unique spices that can really add intensity to a dish. Worth buying. This regal tarragon is fresh and smells amazing out of the container. I like to use is on grilled and baked poultry dishes yum yum! I use these tarragon leaves in the base of my bearnaise sauce. They have a delicious licorice flavor that is associated with classic bistro food. Another great value from Regal! As we run out of of "name brand" seasonings we have been making the switch. This tarragon was fresh and again a great value. At first looks it doesn't seem to be aromatic but once you pop open the seal it burst with aroma. It's slightly sweet with hints of subtle herbiness and has been used in just vinegar, I hope to use it in some eggs as they are plain without any seasoning. These Tarragon leaves have great flavor and are a good grind. Great for my lemon tarragon chicken, and almond tarragon chicken salad. Great value, will buy here next time. Outstanding quality and intensity; we use it for sauces and roasted meats and it takes chicken salad to the next level. My only complaint is the same that i have for all the leaf herbs...the shaker side of the top is useless. I know it would increase the cost to have two different types of lids so it be cool if the lids could be totally universal with three opening sizes (fine, leaf, pour). I found this tarragon to be very fresh. It makes a great addition to mayonnaise or aeoli for sandwiches and burgers. I like the bright sharp herb in contrast to rich savoury flavors. I've been very impressed by all of the Regal herbs and spices, including the mixes. This one is no exception. Excellent with chicken, or as a secret ingredient in pizza sauce. I love to tarragon and I use it almost everyday. It's very high quality and that's the first thing I noticed when I opened the seal. And it's at a great price. Thank you for the very low price. I would definitely recommend to friends and family. I love using Regal herbs and spices. I have not been disappointed in a product by them yet. This is quality product at a great price. Incredible price! I am not a professional, I bought this for home use. It's a large bottle but that's okay. It has been months and so far it has stayed fresh-smelling. My husband wanted this spice as he was making his famous chicken compote.He rubbed the Tarragon, Rosemary, Parsley and many other spices as a rub all over the chicken. The smell is holy. You brown the fresh chicken in a cast iron skillet. They sell all types here at WEB.COM. He removes the chicken and put it in a large casserole baking dish Then adds homemade chicken gravy, and adds mixed large veggies..Oh my goodness, what a great tasting chicken for four people, To make the dinner even more exciting put cooked rice underneath it. We figured the price for this dish was $. 63 a serving. Not to shabby for a complete meal for four people.Especially during these times, so check WEB.COM and see what you need at a fantastic price. HAPPY SUMMER EVERYONE. This container or tarragon is deceiving at 1 ounce, it is actually quite big, it's just that the tarragon is so light. We buy this a few times a year and make a tarragon mayonaisse with it. We are very happy with these Regal tarragon leaves and the price can't be better than what we find at Webstaurantstore. We would recommend this product. Regal Tarragon Leaves 1 oz. are definitely not a second rate product. They are fresh, great smelling, and tasting...... a value at twice the price!! I have never used tarragon in any dishes or recipes so I decided to give it a try. I tried a chicken salad recipe with tarragon and parsley and I was pleasantly surprised with the great flavor and fresh taste. I cannot emphasize enough how strong this herb is. No wonder it is sold in smaller quantities. A tiny bit goes a long way. It's great in tomato based soups and beans. We use this product quite a bit this time of year for the amazing flavor it adds to fish. We have gotten several orders of this from Webstaurant and it has gone above and beyond our expectations every time. Dried Tarragon Leaves are great for making sauces!! Good for using in fish sauces and even adding to a salad dressing too! Excellent price makes this spice a must have!! !